I do not even want to look to find out the last time I officially completed a ds106 assignment (probably last time I taught, Spring 2014). Create a short video that shows a scene from your favorite TV show or movie that we didn’t get to see, probably because it wound up on the cutting room floor. This is ds106 cleverness for turning inside out a familiar story, which requires some insider bit of awareness of the plot or a scene, as much as Bill’s clever play on the Star Trek Red Shirt Ensign. It also reminds me of the clever twist on movie plots of another favorite one, the Messing With the MacGuffin assignment. That, to me, is the essence of ds106 attitude and creativity. I decided to take on the character of Tuco, a.k.a. 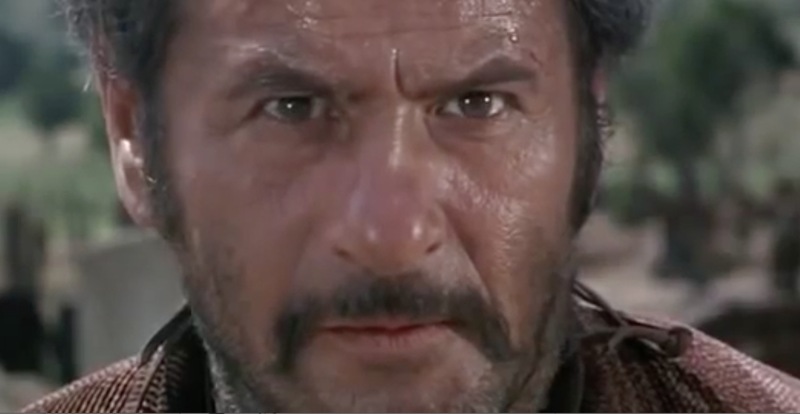 “The Ugly” a.k.k “Tuco Benedicto Pacifico Juan Maria Ramirez”, known as ‘The Rat’. What could I do to pull of his look? No time to grow a mustache. I do not own a gun, but pretended it was off screen, and hangled some coins to try and sounds like bullets. I found a red shirt to wear over a white one, and pulled out one of my two bolo ties to try and match the thing he is wearing. I figured my wood paneling in my den (or anywhere in my house) is a good setting. Tuco would be a guy picking his teeth with a knife. 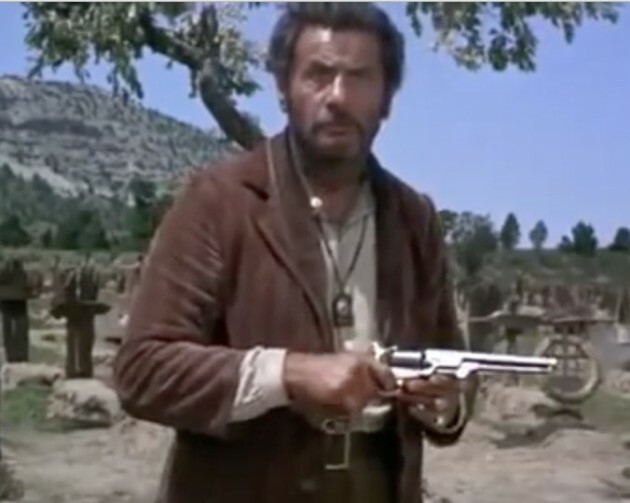 If you have not studied the scene, the way it plays out is hinged on the fact that Tuco finds out his gun has no bullets, Blondie snuck in at night and emptied his gun. It does seem a bit of a stretch that a gunfighter would not check their gun before walking out in that circle. They are always spinning the chambers of those Colt 45s. And the line about digging is what Blondie says to Tuco at the end of the scene. The only thing I forgot to mention was something about that damned cigar Blondie is always chewing. Anyhow, super fun to do, easy to edit. I tossed in a bit of the background music, deliberately ending it abruptly when my character complains about the music. Thanks Bill for creating such an awesome assignment that it pulled me out of the dugout. You’re killin’ this assignment, Dude! I love how much this assignment is heavy on a story and simple on production. You nailed it well. Rockin”!! Love it, well done Alan. I remember watching “The Good, The Bad and the Ugly” *many* times in my youth, sitting on the living room floor just soaking up the atmosphere. If someone does a western themed DS106 I might just have to jump in with guns a blazin’. Alan, un excelente rendimiento! Fun to watch. Also reminds me of the other Clint Eastwood movie I watched recently in which Ramon Rojo is Blondie’s nemesis (in a A Fistful of Dollars.) You’d make a good Ramon! Awesome respect for the costume work, you’re halfway there to move onto sweding. Thanks! There is something to be said for doing the in the moment character with whatever props you can muster.